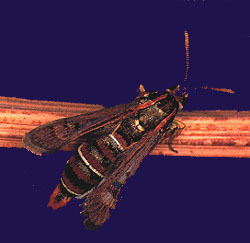 The small, wasp-like Dock Moth has a one year life cycle. The adults are active during spring to late summer. Although they only live for a few days, they have time to mate and lay about 300 small brown eggs to the dock flowering stems. The eggs hatch after a few days and the lava make their way down the stem. They tunnel into the dock root and this is where they do the damage. They feed on the roots over summer and then pupate over winter to emerge as adults the following spring. The feeding of the lava can kill infested dock plants outright. However it takes time for the natural increase in numbers to inflict substantial damage in badly infested areas. Research done by the Agricultural Dept. of Western Australia, funded jointly by Agriculture Western Australia and the Meat Research Corporation.